Want a easy to take along treatment for wasp stings, bee stings, and other insect bites? Try this. Next time you go out for a hike, or even for a drive, make sure your first aid kit includes a bottle of tea tree oil. This little wonder from down under can take some of the bite out of summer insect woes. These little creatures are incredible! They produce, like ants and bees, a substance called formic acid that is injected into you or I when the wasp or bee feels threatened or it's territory invaded. Sometimes there are other substances that react with our immune system and cause a allergic reaction which in some cases can be life threatening. This reaction can come on violently and quickly. An allergic person should carry their wasp and bee stings kit with them. It is important to note, that some individuals who have never had a reaction before have had sudden symptoms appear. Sometimes these reactions occur swiftly, ten to thirty minutes or less!. Things like breathing difficulties, rapid pulse, intense sweating, swelling of the throat or eyes, and maybe a feeling of dizziness. If any of these or other symptoms appear, get medical attention immediately! All that in mind, for most of us, getting stung is just a real pain. 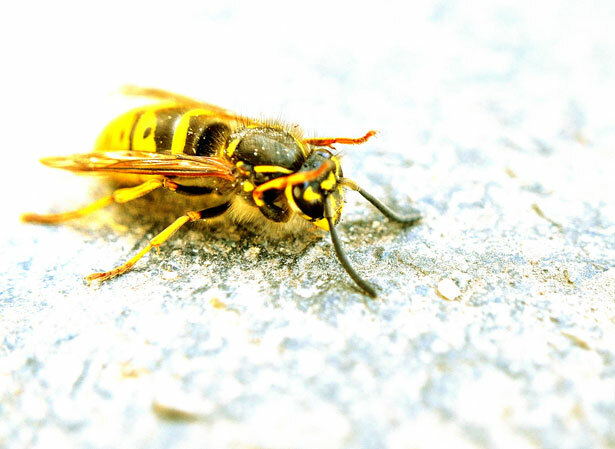 So, how can you best use tea tree oil as a treatment for wasp stings? In our house, and in our first aid kits in both the house and car, we keep a bottle of tea tree oil, benedryl, and vitamin C.
For us, when we get wasp and bee stings, we take the age and weight appropriate dose of benedryl, 1000mg of vitamin C, and apply tea tree oil to the sting 3 or 4 times an hour until the pain subsides. Again, make sure you are getting the best tea tree oil available. Treatment for wasp stings and about 350 other useful products to benefit your total health and wellness needs, can be found from the same source, we'd love to let you in on where we get these products from. Feel free to contact us through the link above. Wasp stings can really put a damper on summer fun, but you can fight back with a little first aid, and some forethought.